This ice-cream has a sweet and sour and crunchy feel when it’s done! Put the bananas & Kiwi into the blender and pulse for a bit so they break up! 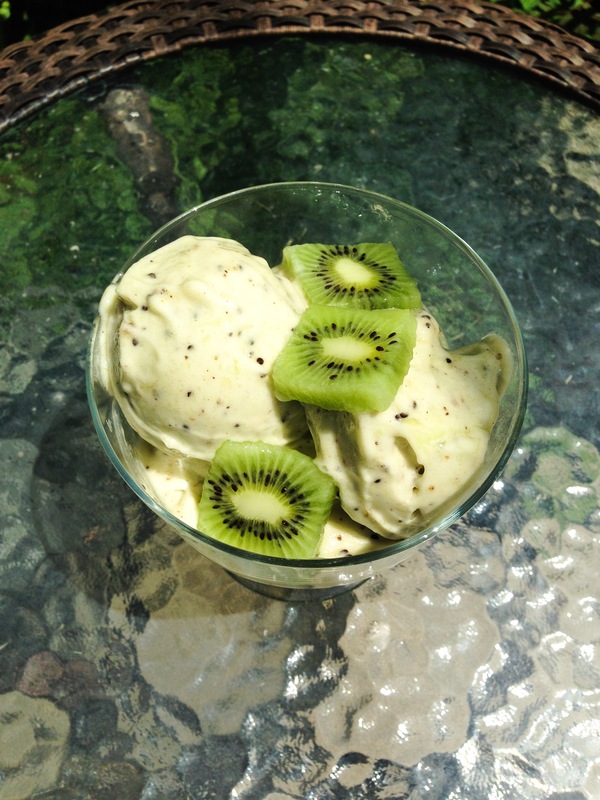 Pour or scoop your Kiwi Banana icecream in a serving dish and ENJOY! Next Orange Banana Icecream? Super simple recipe! Yum! I love frozen kiwifruit dessert! What a cool twist on tropical ice cream! Kiwis are awesome! it is so crunchy and delicious 🙂 Enjoy ! This looks and sounds awesome! I will definitely be trying it! Now that’s a flavor I never would have thought of but I bet it’s good. I know!! it probably my favorite one 🙂 enjoy! I just made banana ice cream for the first time this week. I will definitely have to try this recipe out next time. It looks perfect, I need to try them. Thank you for sharing that! you are welcome 🙂 enjoy !! It’s genius. There are so many possibilities too! Now THAT is what I’ll treat myself to tomorrow! sorry, i am not sure what this is linked to? it says page not found?